No, it doesn’t have the glamour of a striper, the battle spirit of a bluefish, the elusive allure of a bonito. But for easy catching and good eating, porgy is best. As the wooden fishing boat slows to a halt, twenty-three rods rest perpendicularly on the red metal railing waiting for the signal. 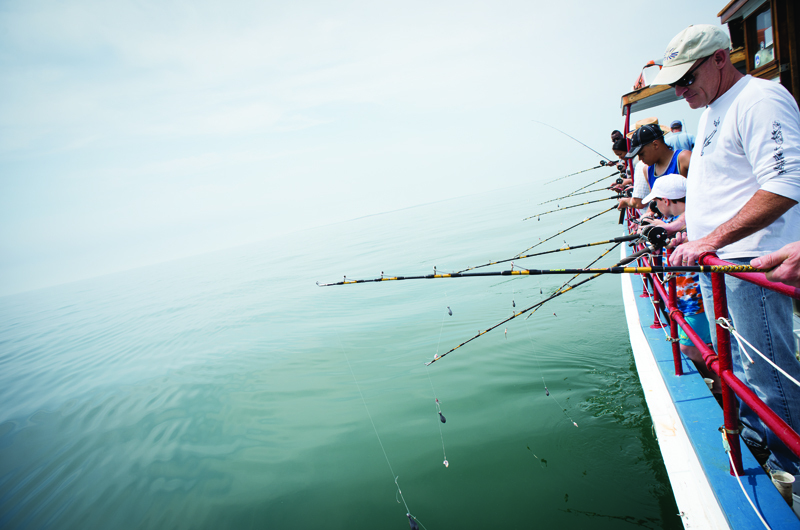 When the motor cuts, the weighted and squid-baited lines drop immediately into the water, finding their way down about fifty feet to the bottom. Tap, tap, tap, the hits come nearly instantly. Within minutes, maybe even seconds, amid shouts and whoops, silver fish dangle from multiple lines. The actions are repeated, and in the two to three hours of fishing off Chappaquiddick, filled buckets signal another successful day aboard the Skipper, a charter boat owned and operated by Captain John Potter out of Oak Bluffs. Kids, their parents and uncles, a group of visitors from Texas, and a couple out on their first fishing adventure chat noisily about their catch. It’s a great day. Bluefish? Striped bass? The elusive bonito? Try scup. These slender, silver fish, are a mainstay for the Skipper, and Potter knows just where to find them as he enters his twenty-eighth summer of taking people fishing. Sometimes the catch can include local fluke and black sea bass, or blues and bass, but if all else fails, the not widely recognized scup suffices. Scup. Even the name sounds dismissive. It’s not served locally in restaurants as a rule; and it’s rarely sold in Vineyard fish markets, despite its abundance in local waters during summer months. And it probably comes as news to many that the fall Martha’s Vineyard Striped Bass and Bluefish Derby is not the Vineyard’s only derby mainstay. There’s also a yearly Scup Derby, though it’s by invitation only. 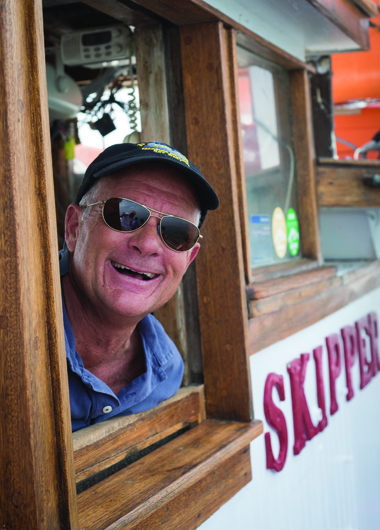 Each year since he bought his boat in 1987, says Potter, a client charters his boat and fills it with friends for an annual Scup Derby. Awards are given for the most scup caught, the largest scup, the shiniest scup, the best scup outfit, and a few other categories. “It was kind of a spoof,” explains the captain. “It’s kind of like the guys decided to go out and have some fun a long time ago.” The fun and tradition continues until today, more than twenty-five years later. Enjoying scup, which can be found in waters from North Carolina to Massachusetts, has gone in and out of favor over the decades. The Narragansett Indians called them mishscuppaug, from which both “scup” and “porgy” – the fish’s common name south of New England – are derived. The scientific name is Stenotomus chrysops. Scup can grow as large as eighteen inches and weigh three or four pounds, but they average more like one to two pounds, and the legal length for keeping a scup is ten inches. That regulation and others were enacted a few years ago when the scup population was on the edge of collapse due primarily to large commercial draggers tossing out juvenile scup as a by-catch in the squid fishery. The good news is the policies appear to have successfully restored the species. 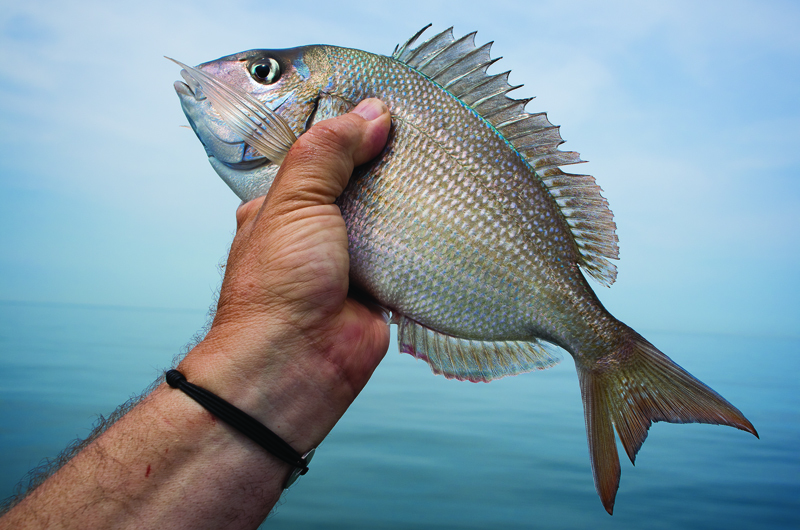 Scup makes perfect fish sticks – that’s about the size of the typical fillet. This is probably the quickest and easiest method of cooking your freshly caught scup. Dipped in egg wash and flour to make the bread crumbs stick, the mild white fish gets a crispy and crunchy outer coating. A squeeze of lemon is nice, though a topping of a tomato salsa would also be delicious. Many people like to deep-fry scup. And Potter remembers with fondness his grandfather’s pan-cooked scup and eggs for breakfast. Of the many local cookbooks that include recipes for locally caught fish, Cooking the Catch by the late Dave Masch of Falmouth wins the prize for preparing scup with a collection of recipes that include baking, grilling, and pan-frying, using both fillets and the whole fish. Ceviche is a favorite dish of mine to prepare for guests and parties using just caught Vineyard fish such as fluke or striped bass. Substituting scup did not disappoint. The fresh fish is cut into small dice and covered with lime juice for a few hours to cook. I combined it with the flavors of summer – tomatoes, corn, and basil – and spooned the chilled ceviche on corn chips. It quickly disappeared. Probably the best tasting of all from my trip aboard the Skipper was the grilled whole scup – scaled and stuffed with a few herbs. Cooked over a bed of coals, the smokiness and texture of the meat made it worth picking through the bones. After both experiences of catching and eating this local fish, I join the lucky and proud few that Keep on Scuppin’. Aboard the Skipper, fishermen are about to send their bait down to the scup below. In August, scup can be caught all around the Island, from shore and boat. They will take bait readily and are fun to catch. 1. Rig a fishing rod with the sinker approximately two feet above the hook.